You can find out more information about the V-LCD71MD in the press release below, at the Marshall Electronics booth #C6019, as well as on their site at www.lcdracks.com. The new monitor offers the same advanced features of the popular MD line, now in a full resolution format. El Segundo, Calif. (March 28, 2014) – Marshall Electronics has unveiled the new V-LCD71MD Full Resolution Camera-Top Monitor in the popular 7” size. The V-LCD71MD 7” camera top monitor has a full resolution 1920 x 1080, high brightness, LED backlit IPS panel to display the truest image in vivid detail. Using a full resolution camera-top monitor during production is critical for shooting video that will be played on HD screens in full 1920×1080 resolution. 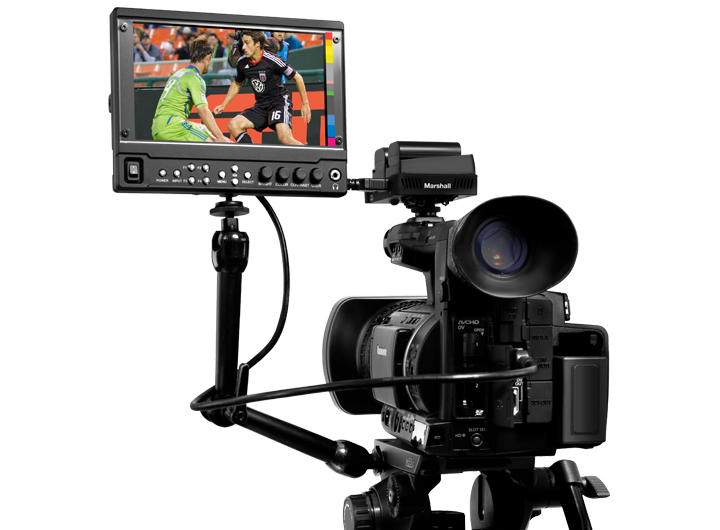 The V-LCD71MD literally allows the director or videographer to see the full picture. Advanced features like Peaking Filter and False Color Filter give the user total control over the video or image. The V-LCD71MD is ideal for both DSLR and camcorder use. The V-LCD71MD has a native 16:9 aspect ratio and supports industry standard 1080p 60 over 3G, as well as HDSDI (1080i / 720p) and SDSDI (525i/625i). Features include Waveform Display, Stereo Audio Bar display, Icon Driven Menu System, Pixel-to-Pixel function, Gamma presets, Custom Screen Markers, plus Marshall’s industry leading PEAKING Filter now in four colors. The V-LCD71MD can also play back two channels of embedded HDSDI audio or two channels of HDMI audio via the front panel headphone output. All of the MD series monitors come equipped with an HDCP compliant HDMI input with pass-through, a selection of 10 available battery adapters, and a choice of one Input / Loop Through module or an HDMI to HDSDI Output module.